Why Do Active Shooters Succeed? 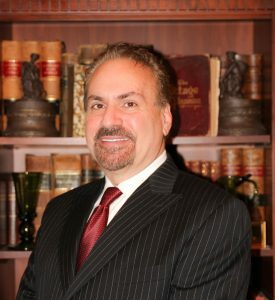 Why Do Active Shooters “Succeed”? You might associate armed attacks with wars or survival scenarios, but they can occur in normal times as well. The recent mass shooting at the Mandalay Bay in Las Vegas is a reminder that, in these toxic times, no one is safe from those with bad intentions. It’s hard to read the news without seeing reports of the latest mass shooting by terrorists, the deranged, the disgruntled, and in the shooting in Las Vegas, people with no apparent motivation at all. Few believe that they could possibly wind up in the crosshairs of a gunman’s sight, but it can happen anytime and anywhere. Why do they seem to “succeed” so often and what would be your response to the “active shooter”? Many of the concert-goers in Las Vegas were victims of what we call “normalcy bias”: That’s the tendency for people to believe everything follows a pattern and that the day will proceed normally because, well, it usually does. It’s a natural response for most, and is reinforced by the rarity of mass casualty incidents. But when a shooter event breaks that pattern, the unprepared brain takes time to process the situation. People think that the sound of gunfire is, instead, a burst of firecrackers, a blown tire, or anything less threatening than an assassin out to kill them. This pause leads to a type of paralysis than was worsened in Las Vegas by the ready availability of alcohol. By the time good judgment came into play, many were already victims. Given the circumstances, the rapid action of Las Vegas law enforcement is to be commended. Remarkable, in fact. Police were receiving multiple false reports that made it appear that there were multiple shooter events in a half-dozen casinos. There was even a car with wires sticking out of the trunk at New York New York casino’s valet that was thought to represent a bomb. Listening to police radio communications during the event, it’s amazing that such a coherent response was possible. Most citizens, indeed, believe that the good people of law enforcement and homeland security are always right there. While these agencies do the best they can to counter situations like this, most mass shooting events end so quickly (the Orlando nightclub shooting is an exception) that the chances are slim that help will be immediately at hand. It took just one 31 second period for the Las Vegas gunman to shoot 280 rounds, and possibly just 9-11 minutes (according to Las Vegas Police) before he ended his own life. Without a plan of action, the average person follows the herd. If fifty people around you (or in Las Vegas, 22,000) drop to the floor, your natural tendency is to do the same. Cowering in fear in plain view of the shooter, however, is a recipe for a very bad outcome. By having a plan before a shooting event occurs, you’ll have a better chance of getting out of there in one piece. These are things you should be thinking about, calmly and rationally, whenever you’re in a crowd. It may seem extreme to have to consider such options, but the headlines suggest otherwise. This relaxed vigilance is called “situational awareness“, a concept first put forth by a military pilot to pertain to dogfights but which has special importance today for the average citizen. The standard recommendation, in order, by the Department of Homeland Security is “Run, Hide, Fight“. 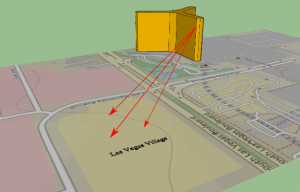 In the case of the Mandalay Bay shooter, the distance between the shooter and his targets effectively precluded the ability to fight, so running away from the kill zone and/or hiding in buildings and vehicles saved lives. Situationally-aware concert-goers were saved by a high index of suspicion and, hopefully, a low blood alcohol level when the bullets started flying. If you’re inside, know where the exits are. If you’re outside, know the nearest route away from the area or reasonable nearby shelters. Know who near you appears nervous or suspicious. If you’re in a crowd, stay in the periphery, not center stage. Assume that the sounds of gunshots are gunshots, not firecrackers. Know the direction the gunshots are coming from and head the other way. Primed for a possible emergency, you’ll decrease the chance of becoming a victim. Sounds simple, doesn’t it? But in this era of people immersed in their smartphones, few are situationally aware. In the old days, this might result in a bump on the head from walking into a lamp post. Today, the results can be tragic. Don’t be the soft target that assassins look for. Remain situationally aware at all times, and decide how important it is for you to be in the midst of large crowds. Perhaps it was once paranoia, but in these uncertain times, it’s more like common sense. 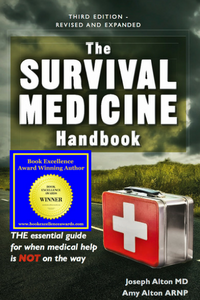 Learn more about situational awareness, disaster medical preparedness, and much more in the 700 page third edition of the Survival Medicine Handbook: The Essential Guide for When Medical Help is Not on the Way, 2017 winner of the Book Excellence Award in the category “medical”. Also, Nurse Amy has designed two kits specifically meant to stop bleeding in one or several victims after a disaster such as occurred in Las Vegas. You’ll find them at store.doomandbloom.net. We got shots fired! Sounds like an automatic firearm. Anyone have eyes on the shooter? It’s coming from up there. It’s coming from Mandalay Bay. 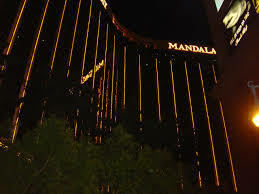 I see shots coming from Mandalay Bay, halfway up! We have multiple 415 (assault/battery with a gun)… do we have surge? We have an active shooter! We have an active shooter inside the fairgrounds! Just advising, there are people down on stage left. Dispatch: We now have an open line with a female saying there is a shooting. Control, that is correct, shots fired from Mandalay Bay. There’s many people down, stage left, just be advised. I need eyes. Somebody in the CP, can you tell me where it’s coming from? Dispatch: We’re hearing it’s from Mandalay Bay! I’m at Mandalay Bay and the boulevard. I need five officers on me. We have multiple casualties, GSWs in the medical tent! Multiple casualties! Be advised, shots are coming from Gate 7. We need the boulevard shut down at Russell northbound right now. It’s coming from, like, the 50th or 60th floor, north of the Mandalay Bay. Coming out of a window. Seeing multiple flashes in the middle of Mandalay Bay on the north side. Kind of a, on the west tower, towards the center of the casino. Like one of the middle floors. On the 31st floor, I can hear automatic fire coming from one floor ahead. Be advised, it is automatic fire, fully automatic fire from an elevated position. Take cover. That’s correct, it is full automatic fire. Multiple GSWs to the chest, legs, femoral arteries, at the medical tent, (Gate) 4A, off of Giles south of Reno! Flashing coming up from a third of the way up center tower of Mandalay Bay! All units stop coming northbound on Las Vegas Boulevard, because he’s shooting this way, horrible cover spot. I have a gunshot victim at gate 4, in the leg. I got one down, gunshot wound to the leg, Reno and Giles, I also have another female gunshot in the mouth. We need to send medical when you can over to Reno and Giles, expedited, please. Just be advised, we’re pinned down on the east side las vegas boulevard. We’re gonna be north of Mandalay Bay drive, we’re about 40 or 50 people pinned against this wall. We’re taking gunfire. It’s going right over our heads. There’s debris coming over our heads. So we’re pinned down here with civilians. I have a gunshot victim at gate 4. Gunshot to the leg. Hey, we can’t worry about victims. We need to stop the shooter before we have more victims. We have multiple, multiple victims shot. Get the medical kit, we got a victim shot in the leg. Hey, officers please stay calm, just relax, we’re trying to get this set up, just stay calm. Shut down the elevators, take the stairs. Any officers that respond here, gonna be in plain sight. We’re getting from civilians that there might be three shooters. Set up a perimeter, Tropicana and Russell, and lock a good outer perimeter down. We need a perimeter now. Arriving, I’ll establish a command post now. I’m here on the 32nd floor, room 135, I need the SWAT. I have multiple resources here, we are setting up IC here, is that what we want to do? Just be advised, there are multiple trucks loading people to send to the hospital. Just let them know. All officers, do not respond to the east side of the boulevard north of the Mandalay drive. This is not a secure position. We will be pinned down. SWAT: Has anyone from the outside heard any further shots? We are clearing the left wing now. We have a white RV with an older white male in fatigues and a black bag. Came from that area of the shooting. Went into the motor home. Need additional units. I had a civilian take a patrol car. Need somebody be over here at Giles. I need medical. Need some more units over here. I’m being overrun by citizens trying to take patrol cars. Confirming that I have casualties at Ali Baba and Giles east of the Catholic shrine as well as in the Mandalay Bay so we have two scenes. Whoever with the maintenance guy at the Mandalay Bay, we need the key for the elevator at the main bank of elevators. We have a whole bunch of us waiting to go up. I need to know if I have that floor evacuated other than our suspects. We got snipers going up so I need to know that’s evacuated. That’s gonna be a negative. We have several 419s on the main stage. I need a couple more officers to help me clear this area. Confirming that Mandalay Bay and Giles and Alibaba are the two shooting locations. Is there a third? We have a 12 man element coming into the Mandalay Bay. Strike team. Is it confirmed that there were no shots from the Luxor? Do you need more resources up there or you good? We have the hallway contained. I have three critical patients in my vehicle, I’m taking them to sunrise. Is there any available vehicles to assist me to get the traffic out of my way? We have a ton of rescues that are available. We need to roll now! Please be advised I’m now transporting five critical to Sunrise. Please call and let them know I have five in route. We are going to start establishing certain roles. First, we’re going to have a casualty collection point at Tropicana and the boulevard. I will get someone to liaison that in a moment. We’re going to contain around Mandalay Bay. I will get you a lieutenant for that in just a moment. I am at Tropicana, I can fill that role for you. SWAT: We are right outside the door. Medics are asking if they can proceed to four seasons and Las Vegas boulevard or if they can have officers drive the vehicles that are there with injured civilians down to a safe area. I have strike teams available, I need to know where to deploy them. Medics are saying if there’s any reports of civilians in vehicles on four seasons and the boulevard. They can’t get to them safely, but if officers can drive those vehicles to a safe area, they can service them. We are near the sports book at Mandalay Bay, we have one male WMA wearing a maroon or black shirt near the entrance. Possible suspect at Circus Circus, we need an ETL on that. We’re going to have a lot of people transporting in pickup trucks en route to the hospital. Please advise the hospital. Please be advised we have the singer and citizens on the bus and the manager is adamant that they do not want to exit the bus. We’re going to develop a route for them to exit. UNC is at capacity. All units be advised do not transport unless it is life threatening. They need to go to Valley. Black Audi with a possible 445 at the Luxor valet. SWAT: We are at the end of the hallway, there are officers to acknowledge so we don’t have a crossfire. We have another GSW at the Motel 6. Do we have a 415A at New York New York? It originally came in to say many subjects were down. Two shots were fired inside New York New York, we have approximately 150 people sheltered in place in the kitchen. Two shots were fired inside casino floor, And there are several subjects down at New York New York “Zumanity”. In Valet, waiting on a strike team to arrive. Everything seems quiet here. I need someone to get in through the cameras to see if this is a diversion. I have three metro SWAT basically assembled, two are going up the tower, one is heading over to New York New York so we don’t completely split our forces. Dispatch: Ok, now I’m getting information on an active shooter at Tropicana. Please advise bomb squad to deal with the issue over there at Luxor. The 445 device. Dispatch: Please be advised, there is an active shooter at Tropicana. There is an active shooter at Tropicana. Please be advised, we’re getting multiple reports of shooters at multiple locations. May or may not be diversion. Entering New York New York with a SWAT team. I’m outside Tropicana, not hearing any 434s (illegal shooting). This could be a diversion. Dispatch: Be advised, 70 civilians at the stand aviation hunkered down. We’re getting calls from people sheltered in place, they’re not injured. Do you have any instructions for remaining sheltered in place? Please assign someone in there to keep track of people who have injured calling in. We have a bunch of ambulance on Tropicana. Do they have Force Pro with them if there’s a e a 415A at the Trop? Dispatch: Please be advised, we have a hispanic male, dark skin with an afro and dark clothing with a backpack at the Hooters squatting in the driveway. Looks like a suspect. Do we need more strike teams, we have other agencies calling. Dispatch: If we have other Tac teams, if we have bodies available, have them come in to our staging area, south central command. We’re gonna need a roll call of those in Mandalay and the strike teams. SWAT: I’m at the suspect’s door. I need everyone to be aware of the hallway and get back. I need to pop this to see if we can any response from this guy, see if he’s in here or if he’s moved somewhere else. Dispatch: SWAT has explosive breach, all units move back, move back. We’re in this room, one suspect down. SWAT: Preparing to breach adjoining room, floor 32. Explosive breach. SWAT: We got the east room secure, one suspect down, multiple firearms. This is definitely where he was firing into the crowd. I’m getting reports that medics are getting shot at, at the Tropicana. We have made contact inside Tropicana, no shots fired. We are at Tropicana. No shots fired. Security at New York New York says no shots fired. Do we have an update on the possible 445 at Luxor? We have it locked down. Clear the area, do nothing else for the time being. Now we’re getting shots fired at Caesar’s and the Bellagio…..